Does Transportation Drive Land Use? But let’s keep in mind that transportation is profoundly a vicious cycle and significantly changes behavior and markets over time. For example, when/if we add capacity or widen major roads, we set into motion some enormous political and economic pressures, and behavior changes. Widening a road will inevitably reduce the number of bicyclists, pedestrians, and transit users (because it is now more difficult, unsafe, and unpleasant to use the bigger road). This creates more car trips (“induced travel”). And the induced travel created by the widened road, is used, post facto, to justify the widened road (a classic self-fulfilling prophesy). Because the bigger road carries more high-speed traffic, it becomes unpleasant to live along the road. So, over time, housing values decline along the road, and single-family gets converted to student rental, multi-family for students, office and retail. And because it is now more pleasant and fast to drive a car, people are better able to live in remote areas and commute to their jobs in the city. Why? Because cross-culturally and throughout history, the average daily roundtrip commute is 1.1 hours. Some people will relocate to more remote locations to create a new equilibrium when the road is widened. Many people dream of living in a “cabin in the woods.” Therefore, wider roads create a strong demand for sprawl housing, because the wider road reduces travel time from home to daily destinations. 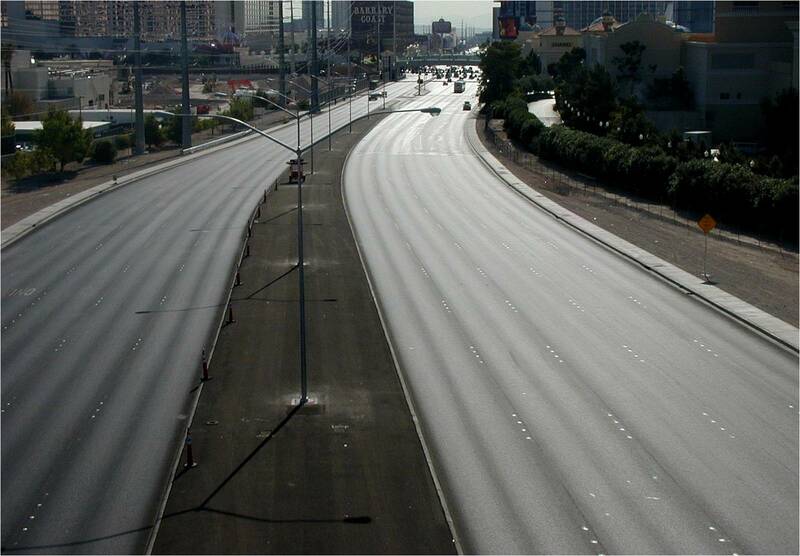 Is sprawl possible without car travel? Could a huge number of us live in remote locations if our transportation system did not provide cheap and easy car travel? Most people would be unwilling to live in low-density, outlying, sprawling areas — or drive a car for every trip — unless roads are designed for high speeds and high volumes, and parking is both free and abundant. All the conditions that people dislike about the city — whether real or perceived — such as noise, crime, etc., can be more easily fled if the newly widened roads allow you to get to work each day in a reasonable period of time, even if you live in an outlying area. The ultimate result is that as we add capacity to streets, we set in motion a pattern of sprawl and strip, we wipe out farms, and we accelerate the decline of in-town areas. Quite often, our transportation planning advisory boards are dominated by home building interests. Clearly, this industry realizes the fundamental importance of widening roads to create sprawl residential markets for them. 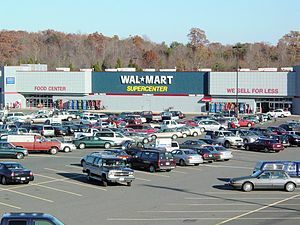 As for retail land use impacts caused by transportation, when there are so many cars being carried by a bigger road, business people cannot resist putting enormous pressure on staff and officials to rezone the businessperson’s property to retail in order to take advantage of all those potential customers driving by each day. This is precisely why we see so many big box retailers clamoring for sites at major intersections. In fact, in the planning department I work in, we get calls all the time from people who want to rezone from residential to office or retail along our major arterial streets. High-volume big box retailers, except in large, high-density cities, are not viable unless the public sector provides large subsidies in the form of high-speed, high-capacity, multi-lane streets (big roads enable the big box to draw cars from a regional “consumer-shed”). Not only that. These retailers also depend on the public sector to allow them to build enormous and free surface parking lots, and enormous building footprints. As expected, we so often have strip commercial – intense land use development pressure — on major roads near interstates. Could such streets have been anything else other than strip commercial, given the street design and the access to the Interstate? Are single-family homes viable along such a street? If you owned land along such a stretch, would it be rational for you not to do everything in your power to get the local government to grant you the right to sell to those 70,000 potential daily customers, as the “big box” retailer so often wants to do? I’ve seen land use plans and maps prepared in the past, and I know that it is not a “plan” at all. Almost entirely, when we talk about a mostly built-out city, it is simply recording what is there already. Almost none of it is a proactive vision of what the planners want. If we engaged in wholesale land use changes in the land use map/plan to enact our sustainable, livable vision, all of the planners would be in fear of losing their jobs and all of the commissioners would be thrown out of office. Elected commissioners and staff are forced, by political realities, to be reactive in our land use “plan.” Transportation, on the other hand, is something we can make changes to, because it is often feasible, politically, to make the change. It matters not a whit whether planners designate a site for retail or single-family residential. Over time, what will happen to the property is determined by the road design and traffic. If the land use designation does not correspond to what is happening on the road, the land use will get changed, or the land will be abandoned. If our street network is designed for modest car speeds, modest car volumes, connectivity, and access (in other words, transportation choice), we will get viable transit, bicycling, walking and neighborhood retail and mixed use, not to mention higher densities, more traffic congestion (which is, in cities, a good thing), compact development, and a control on sprawl. High-speed, high capacity roads will give us the reverse, regardless of what our land use “plan/map” says. Is it not much easier to predict what will happen to the land uses along a street based on the way the street is designed than to predict what will happen to the street based on the land uses along it? Similarly, is it not more feasible to predict whether there will be a sprawled, dispersed, low-density community if we know, in advance, what the street system and form of travel will be, compared to whether there will be future sprawled community based on what the current land uses (or land use plans) are designated for various properties? For example, West Palm Beach FL is currently experiencing a dramatic, beneficial land use change throughout their city soon after they re-designed their streets by removing travel lanes, calming traffic, and doing substantial streetscaping. 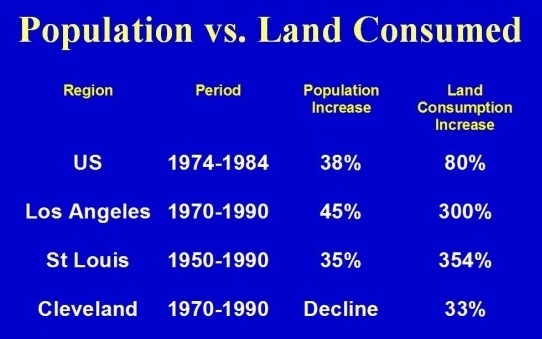 Land use improvements there are clearly driven by transportation changes. 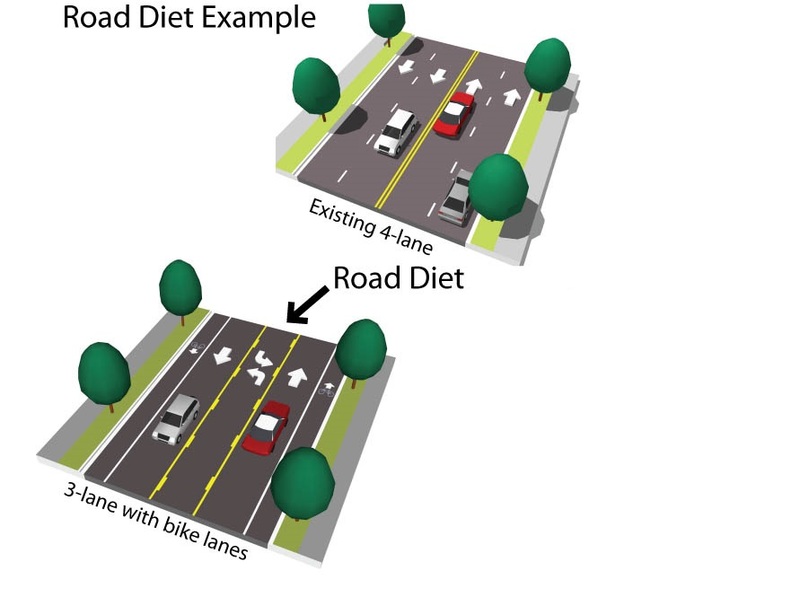 Transportation engineers love to try to deny responsibility when their studies (which are flawed because they don’t accurately account for human behavior) show that a road must be widened. The engineer usually claims that land use drives transportation, and that their high-speed, high-volume roads are merely “meeting the demand created by the land uses.” “It’s not our fault that we must spend millions to widen roads, tear out houses, and ruin the environment. We are forced to because of the land use.” But this ignores the fact that high-speed, high-volume roads create a vicious cycle and substantially modify behavior, as noted above. The important danger of this highly misleading claim from many engineers is that it leads us to incorrectly believe that we have no choice. We must widen the road because of the land uses on the ground. Too often, we are mislead into believing that land use choices we made in the past are now forcing us to widen the road. Engineers must not be allowed to wiggle out of culpability with such an excuse. The traffic engineer who explains it is the land use that “forces” the road widening seems sensible until you look closer and find out how the market brings enormous and unrelenting pressure to change the designations when we change the roads, and how human reactions to road conditions draws or repels residences. If we are incredibly courageous and true to our principles, we might be able to delay the re-zoning for a few years on a widened road that is now hostile for residences. But that just means that because the road carries so much high speed, high volume traffic, it is no longer feasible to keep the property residential because the quality of life is so miserable (as a result, the residential building eventually is abandoned, or is downgraded from owner-occupied to rental), or it is no longer rational to keep it as a farm because you can make millions by selling it for a shopping center or subdivision. Why is Europe so walkable and compact, and the U.S. is not? Is it that they are just more educated and appreciative of the merits of walkable communities? Or is it that they mostly developed before the auto age, whereas we developed after the emergence of the auto age? And why is it that Europe is now, after entering the auto age, starting to see the sprawl we are experiencing? The Florida growth management law requires that “level-of-service” standards be created, and that new developments only be allowed if they are built “concurrently” with the infrastructure and services they would need. But the only concurrency measure from the Florida law that matters is the road level-of-service. Every other concurrency measure – recreation, utilities, solid waste, etc. – is, for all intents and purposes, ignored in comparison. We are fooling ourselves and doomed to a life of permanent, never-ending battles with people who want to rezone singe-family land that they own and cannot use as single-family due to a wide road (granting that there are a few who could live in a single-family home and put up with the noise and reduced property value – sometimes, this is called “affordable housing”). Forty years from now, if we do not fix our major streets to make them more livable, we will, though incremental zoning changes, have those streets lined with offices and multi-family buildings and retail. And over those 40 years, we will have a bunch of planners, citizens, and officials burned out on fighting those never-ending battles. In the long term, as Walter Kulash points out, no force, not even five “no growth” commissioners, can stop that incremental change after we have designed a street for high-speed, high-volume traffic. Yes, we can succeed, in the short term, in keeping property zoned single-family. But that will only mean that we’ll have a bunch of vacant homes, and depressed property values. Once the transport system is in place, the market/political pressure to take advantage of that system is overpoweringly strong, and will overwhelm any countervailing efforts. It hardly matters how courageous, visionary, or progressive a planner or elected official is. If the roads are designed to encourage sprawl, we will get sprawl. No zoning or land use designations (such as “large-lot” zoning) can stop it, and there is no community in the US that has succeeded by trying to control sprawl with designations. When we create and construct our transportation plans, we have, essentially and indirectly (and often unintentionally), established our future land use plans, not vice versa. It is as simple as that, and it is time for us to realize it. All that said, I’m willing to concede that we should have our road and land use plans work concurrently. So yes, we should designate outlying areas for conservation and farms. But unless we concurrently get the transportation right, we are wasting our time. In sum, keeping a road at a modest width with a modest number of travel lanes in the face of projected car traffic growth will, over the long term, result in less per capita car trips on that road, less new sprawl into outlying areas, less big box retail, more viable neighborhoods, a higher quality of life, and more residential density near walkable, livable, neighborhood-scaled town centers. Widening the road by adding travel lanes, over the long term, would give us the reverse. The excessive capacities that we typically build for our cities gives us too much sprawl, densities that are too low, and auto dependence. 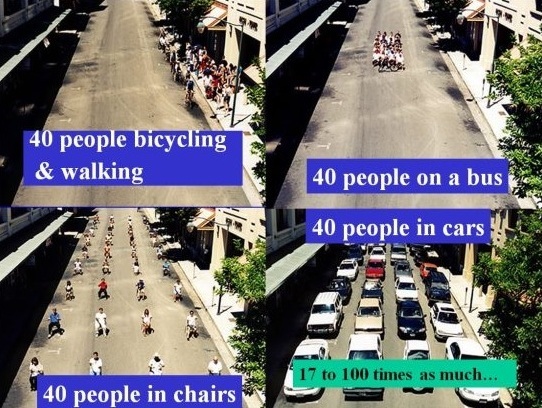 I believe that we should put a moratorium on adding street capacity to streets in our cities, before we wake up one day and wonder how we let ourselves become another auto-dependent south Florida, instead of a sustainable, sociable community featuring transportation choice, safety and independence for our children and seniors, and a unique community we can take pride in. In the long run, the street shapes the land uses that will form along it much more profoundly than how the land uses would shape the street that forms through them. Let’s not let the traffic engineer fool us. Let’s not put in big roads and then valiantly try (and fail) to stop the sprawl and strip, and then flog ourselves when we are unable to stop the land use degradation. Transportation comes before – and determines — land use. A high quality of life, and sustainable future, depends on our realizing that. The conventional car level of service standard nearly all communities have used for several decades is almost entirely designed to measure the ease of car travel. But when we take actions to ease car travel, there is no win-win. Providing for cars is a zero-sum game. That is, each time we make car travel easier, we make travel more difficult for bicyclists, pedestrians and transit users. 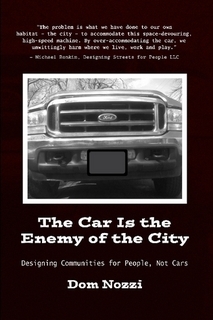 Providing for cars is also a recipe for downwardly spiraling quality of life for the community. Using a car level of service (LOS) standard as our measure of transportation “success” implicitly assumes that congestion is an accurate assessment of quality of life (and quality transportation). However, using a conventional car LOS standard, which nearly all communities have done for decades, perpetuates a ruinous assumption that free-flowing traffic and quality of life are one in the same. In fact, when one observes which cities have the worst congestion, it would seem that the reverse is the case. 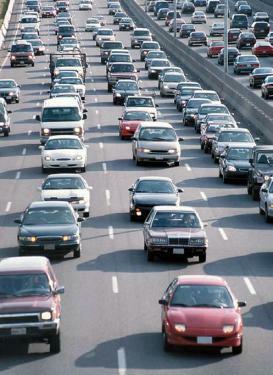 That higher congestion levels commonly means a more impressive, attractive community. We need to ask other, more appropriate questions to measure quality of life (and transportation): How healthy is the retail? The downtown? Are large numbers of tourists interested in visiting? Are there lots of bicyclists? Transit users? Pedestrians? How expensive is downtown housing compared to similarly-sized cities? Are residents proud and protective of their city? In my view, asking about LOS is nearly irrelevant to the question of healthy transportation and quality of life. Indeed, a good argument can be made that there is a negative correlation between using LOS as a measure and the quality of the transportation and community. An unintended consequence of using LOS is, as I mention above, perpetuating the asking of the wrong question. Asking about LOS distracts us from asking better questions along the lines of those questions I suggest above. Asking the right question is often the crucial first step in taking beneficial actions (or, in science, solving puzzles in the field of research). Long ago, for example, we didn’t reduce the cholera epidemic by measuring how many prayers were said. We asked how we could reduce contamination by bacteria. First, a list of reasons why Big Box retail (such as the Wal-Mart Supercenter) is deadly for communities and should be prevented from ever being allowed in a community. 1. Big Box retailers do not create an improved retail environment for a community or result in a net increase in jobs. Instead, they tend to cannibalize existing, in-town retail sales and in-town (often locally-owned) jobs. This is true at both the local level and the regional level. No net increase in retail sales or jobs. Just a geographic shifting from existing businesses to the Big Box retailer. 2. Big Box retailers drain dollars from a community. Instead of cycling those dollars within the community, Big Box steadily impoverishes the community by forever removing wealth from the community and pouring it into the bank accounts of out-of-town executives which have no allegiance to our community — nor any care for our welfare (since they don’t live here). 3. Big Box retailers promote extreme levels of car dependency for those who live in the region — which is a deadly, downwardly spiraling trend. Excessive car dependency destroys community quality of life, significantly harms community sustainability, increases our dependence on oil, outside corporations, and foreign nations, bankrupts households and local & state governments, wipes out our downtown, transforms us into an “anywhere USA” kind of place that eliminates civic pride and a unique community character, and ruins our natural areas. Big Box retailers powerfully promote car dependence by being placed in locations (and have site design) which make it impossible to travel to the store without a car. As a result, an increasing proportion of community residents must make an increasing number of trips by car (thereby increasing car dependency). In part, this increased car dependency is caused by the fact that the Big Box wipes out in-town businesses that were accessible by means other than the car. 4. Big Box retailers, by wiping out local businesses, reduces consumer choice in products, since increasingly, the only products available are those that are sold by the Big Box. 5. By being so excessively car-dependent and designed to serve a regional “consumer-shed” of motorists from up to 10 miles away, Big Box retailers enable a sprawl lifestyle. That is, life becomes more feasible, and therefore BREEDS more sprawl households because sprawl is now more attractive. How can Big Box retail be prevented from locating in a community? 1. Keep your roads small and human-scaled, not Big Box scaled. Do not modify nearby roads to add road capacity (for example, by adding turn lanes at intersections or adding travel lanes). If nearby intersections or roads (or interstates) are already “overweight,” put them on a diet by removing turn lanes and travel lanes. Admittedly, this is a very long-term strategy. But the terrible reality is that this nation has spent several decades spending trillions of public dollars to build HUGE interstate highways and huge local arterial roads. The predictable result of this enormous public subsidy is that it gave birth to a nation-wide epidemic of Big Box retailers. Such retailers can only exist if they are able to gain access to an enormous, regional “consumer-shed” of customers (customers from multiple counties). The big roads and interstates have created that opportunity, and Big Box executives are taking advantage of this opportunity by building Big Box throughout the nation. With small roads, Big Box retail is impossible. With large roads, Big Box is inevitable. In essence, we are now paying for the sins of our forefathers and foremothers, who chose to squander ungodly sums of public dollars to widen roads, and therefore indirectly and heavily subsidizing Big Box retailing. It is naive to think we can stop Big Box until we start reversing the blunder of building these monster roads and interstates. 2. Enact a size limit for the retail square footage allowed in your community. Many cities have created a maximum retail floor area allowed in their community. 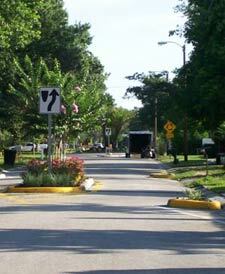 Usually, this maximum is applied in a more walkable location such as a town center. A maximum size is more legally defensible when it is applied to a location in the community where walkability is the community objective. A place, in other words, where excessive car travel is detrimental to the objectives of the community. What strategies are NOT effective in stopping Big Box? 1. Environmental regulations. They tend to be very weak and very easy to evade — particularly by a well-heeled developer. 2. Generous landscaping and open space requirements. These are minor “window dressing” items that are trivial when it comes to the problems that Big Box brings to a community. And again, they are easy to provide for a well-heeled developer. 3. Restrictive building design requirements. Again, these are minor window dressing items that are trivial in the overall picture. The problem with Big Box is not that the Box is ugly. Granted, the typical, formulaic Big Box building is not pleasant to look at, but on a list of 100 problems that a Big Box inflicts on a community, ugliness is about #99. And well-heeled developers will often provide aesthetic improvements if push comes to shove. 4. Appeal to the harm the Big Box will bring to “poor people.” In public meetings, the Big Box will always have the moral high ground when it comes to “poor people.” After all, don’t they provide “Low, Low Prices” that “help” poor people? Arguments about how the Big Box provides “excessively low-wage jobs with no health care” or how they “promote sweat shops in Mexico” are too abstract and complex for the sound-bite conditions of a public meeting. Several problems here: First, it is pocket change for Big Box to come up with the dollars to increase the size of nearby roads/intersections. Second, it is often the local or state government that ends up (further) subsidizing the Big Box by using public tax dollars to increase such road capacity. Third, such big capacity roads enable Big Box. They must have such roads to be successful. It is therefore not a “punishment” to request they provide such roads. Indeed, I suspect that the Big Box often deliberately lets the perception arise that “nearby roads need to be enlarged to avoid congestion,” when all along, the Big Box was secretly hoping that this “concession” would be “demanded” of them. The Big Box cannot exist without the Big Roads and Big Intersections. For the local government and its citizens to insist on such roads is playing right into the hands of the Big Box. 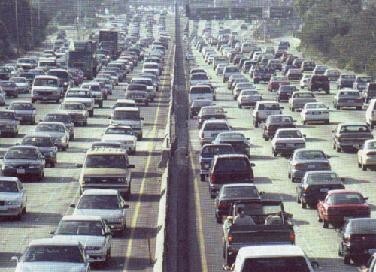 Fourth, in urban areas, traffic congestion is our friend. It promotes many things a healthy community desires: infill development, less single-occupant vehicle travel, higher residential densities, more mixed use development, lower regional air pollution and fuel consumption, taller buildings, less asphalt parking, healthier transit, healthier small (and locally-owned) business, and less suburban sprawl. If Big Box cannot be stopped, how can they be made more palatable? 1. The Big Box must be required to be “mixed use.” That is, high-density residences should be incorporated on site and adjacent to the site. The site should be developed to contain a gridded street network with narrow streets, on-street parking, multi-story buildings, street connections to adjacent properties, and compact building arrangement so that it mimics a walkable town center (open-air “lifestyle” center shopping malls are becoming quite popular throughout the US these days). 2. The Big Box must not be enabled by enlarging the road capacity near it (do not add additional turn lanes at intersections near it and do not add travel lanes on roads near it). If any road modifications are made, they should be to reduce such capacity. 3. The Big Box must not be enabled by allowing it to install an enormous asphalt parking lagoon to attract tens of thousands of car-dependent shoppers. The parking must be kept modest in size (no more than 1 space per 500 feet of floor area) and must not be allowed between the store and the roads that serve it. 4. 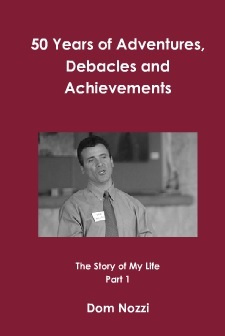 If #1 above is not achieved, the Big Box must be required to sign a legally-binding agreement that it will be financially responsible for demolishing the structures it builds on the site and restoring the site to its original condition after the inevitable day in the near future when it abandons the site (usually to build something even bigger somewhere else). 5. The Big Box must not be allowed to select a site that is environmentally significant. Big Box retail will be unable to survive the coming big increases in the cost of energy and the cost of enlarging roads. They are therefore a short-term phenomenon. It behooves communities to prepare for this by either requiring the Big Box to be designed for its re-use as something else in the future, or to prevent the Big Box all together. 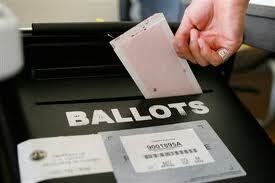 Good Idea to Design Communities With Citizen Referendums? In 2008, community activists in Florida fed up with what was happening to their communities due to bad land development and growing traffic congestion proposed to change the Florida constitution to allow direct democracy to play an important role in development decisions, rather than trust their elected officials to make wise decisions on their own. Over the past several decades, approval of awful developments was an epidemic. For many angry citizens, then, it seemed like a good idea if citizens were allowed to vote by referendum on proposed land use and zoning change. This nation has suffered from several decades of artificially low energy costs and enormous subsidies of various sorts for suburban sprawl (with big (unpriced) roads and free parking leading the way). These factors have caused massive distortions to the market signals that most citizens respond to by preferring a car-based sprawl lifestyle. As a result, our cities have been abandoned as residential and commercial has decanted to sprawl locations. Healthy cities require agglomeration economies to thrive. That is, cities become healthier when they become denser, more intensive and more concentrated in jobs, retail and housing (that is, more compact). The substantial and long-standing dispersal due to sprawl, then, has been deadly to cities, which have mostly become emaciated, scary ghost towns populated by a dwindling number of dysfunctional people who have no other housing choice but to live in the squalor of abandonment, highway overpasses, auto pollution, and the poverty of a dying city downtown. Concurrently, there is substantial market pressure to grow houses (instead of corn or panthers) in formerly remote cornfields and natural areas (i.e., big profits due to big demand for such housing — demand that would be nearly non-existent without free-to-use big roads and parking). So much pressure that corruption of elected officials is nearly inevitable, as developers have an enormous vested interest in “contributing to” [bribing?] elected officials willing to enable a growth in sprawl markets (through bigger roads, more parking, sprawl upzoning, etc.). Personally, I am encouraged to know that cities across the nation are seeing substantial rejuvenation in recent years. Lots of new downtown housing, which is bringing the health-giving increases in density, intensity and 24/7 walkable vibrancy. This rejuvenation is probably due to a rise in energy costs, Boomers (who are often childless) moving into adulthood and senior years, an increasing disillusionment with the car-based sprawl lifestyle (which many have found to be rather sterile), and the growing recognition that the lifestyle of walkable urbanity is exciting, interesting, diverse, fun and convenient (and safer than the sprawl lifestyle, I should add, since your chances of being hurt or killed in a car crash in suburbia are much higher than your chances of being mugged). This trend is certainly quite helpful in reducing the pressure, profit, and desire to sprawl into important peripheral locations. Cities, after all, are now attracting people instead of chasing them to sprawlsville (clearly the case as we see how increasingly unaffordable it has become to find central city housing). A remaining problem, however, is the market-distorting sprawl juggernaut, which continues to chug along at break-neck speed due to on-going massive public subsidies and the inertia associated with our long history of these ruinous subsidies. Not to mention the gigantic problem of all of the white elephant, low-density development patterns and sprawl-inducing big roads/big parking we’ve built over the past 70 years — all of which will induce sprawl even after we experience a long period of high energy costs and the inevitable ratcheting down of public subsidies for sprawl. There will be, in other words, a lag period once the foundations of sprawl start subsiding. It scares me that the promoters of citizen land use/zoning referendums may be correct with regard to the sprawl problem: We need to move toward more of a direct (instead of representative) democracy (i.e., Mob Rule) when it comes to proposed local government land use/zoning changes. Have a referendum vote of citizens each time land use or zoning for a property is proposed to be changed in the community, instead of just letting elected officials decide. Given the above, it is hard to imagine that we can insulate elected officials from the corruption that inevitably results when there is a lot of money to be made in building sprawl. I should also note here that it is not just corruption that would lead elected officials to vote for sprawl. It is also the fact that an elected official who is not a wise and courageous leader can take the easy route to getting and staying elected by being what I call a Motorist Populist. Making cars happy is nearly always a crowd pleaser — even at Sierra Club meetings.) Therefore, maybe it is true that we are left with this direct democracy idea of letting citizens decide on zoning/land use changes, because we have lost trust in our elected officials to escape corruption. It is probably true, given the above, that the best way to end sprawl-inducing upzonings and land use changes in peripheral locations is to bypass corrupt elected officials and give citizens the ability to decide through referendum. However, the idea of direct democracy is rather terrifying to me. It seems to me that there is a strong likelihood of unintended consequences when we shift community decision-making to every voting citizen in a community. Even if the citizens are relatively well-educated, the Law of Large Numbers means that such votes will inevitably lead to lowest-common-denominator mediocrity. The reality is far worse, though. Instead of being “relatively well-educated,” most citizens will be entirely ignorant of what they are asked to vote on. That scares the hell out of me. As Richard Layman points out, citizens living in car-centric, sprawl-happy America will inevitably vote parochially and counterproductively when it comes to votes for in-town development proposals, because the market-distorting subsidies have compelled most citizens to vote for sprawl, and against the community-wide interests of more density and intensity within city central areas. Citizens are often, in other words, their own worst enemies when it comes to in-town development. Citizen referendums on proposed zoning and land use changes would maybe be good in stopping sprawl upzonings. But it would work against a needed companion: Developments that make cities more healthy and attractive (which indirectly reduces the desire for sprawl). Can we conclude that Mob Rule is the best way to fight sprawl and loss of important peripheral areas? If so, is it so beneficial that it more than compensates for the enormous obstacles that Mob Rule would have for creating more healthy and attractive cities? Is the citizen referendum stick so powerful that on balance, there is less sprawl with it, even if we have diminished the carrot of attracting people to healthy cities by impeding city improvement?